Tonight I'm going to share with you how the Lord has been reigning me in from a dangerous enemy. For those of you who've been with us for a while, it's the black panther on the move again! Anyway - it has become embarrassingly critical and this donation made it possible for me to replace a few things. Wanting to make the best of what I had, I did a lot of shopping around on the internet and noticed, much to my concern, that I was spending hours looking for what I needed. Usually I shop at thrift stores, but that does take a lot of time and it wears me out, and I have a responsibility to you to get the message out every night. So I was trying to avoid that at all costs. But certain things, like long-tailed shirts with turtle necks and slacks long enough for my height to reach all the way to my ankles. I never find in the thrift stores anyway. So, to save time I looked around on line and found almost everything I thought I needed to replace. And there was just enough set aside to cover it. Well, I noticed something rising up from inside of me, after hours and hours of scouring the internet for the right thing. I didn't feel comfortable with at all. I could feel myself constantly being distracted - what about this? What about that? You need this, you need that. You didn't look here? You didn't look there? You didn't use the right words in the search engine - try it again! I could feel something taking me over, and it was nasty! So, I went to the Bible Promises and opened to the heading, Food and Clothing. My first reaction was, "Yeah!! The Lord's acknowledging that I need clothing!" Oh, boy... But then common sense settled in and I said to myself...Clare...what else could this mean?? Better look at both sides. Better look at both sides - better safe than sorry... You see, one of the biggest impediments to clear discernment is an attachment to getting things your own way. You want to be justified in your desire for something, and in an effort to be justified you even twist the Scriptures that you get, even just a little, to accommodate your self will. That's deadly in discernment! You have to be willing to get a big NO from the Lord without pitching a pout. Easier said than done! itself. Each day has enough trouble of its own. So, I thought to myself, 'Okay, that's one reading, Lord.' So I prayed, and I opened the Bible Promises again. What do you suppose I got?? The very same page, the heading with Food and Clothing and Matthew 6. So there was no squirming around this one. Not at all. Just to seal it, I went for my third reading, 'cause I usually get three readings - and what did I get? Parent's Duties. Well, that to us, both Ezekiel and I, immediately means taking care of the souls entrusted to us, being a mother, being a father - looking after the souls entrusted to us. When I opened to that page, I immediately heard the Lord say in my right ear, "How can you teach others what you yourself have not yet learned???" I could feel that I had lost my balance and both the Lord and I were beginning to be grieved. So I told Him, that with His help, I would stop here whether I had what I thought I needed or not. I remember Him saying to me, "Can you? Can you really stop here?" He said it with such compassion and concern. I replied, "Yes. Lord, I think I can." Later on, I had to run an errand and when I was waiting in line I opened my little pocket Bible to Psalm 51, which is THE premier repentance Psalm that David wrote after His sin with Bathsheba. "Have mercy on me, O God". Oh, it's a beautiful, beautiful Psalm. To a casual observer it might not seem like a big thing, me losing my balance or control of my wandering thoughts. But to one who knows my history with the Black Panther and how I almost lost my husband because of my willfulness, it's quite a big thing. Well in worship tonight, Jesus began to speak to me, "The lure of riches is very strong in your family. When I let you go out like that I cringe lest I lose you to the world. There are so many souls struggling with this malady around the world. Would you share with them your battle? I want to set them free, but some of them don't even recognize it's a sin." I knew the guinea pig was coming out of the cage again. I did have a legitimate question that I knew we would all ask, so I voiced it, "But, Lord, isn't it necessity to have certain things?" "It's the driving force behind it that's so dangerous. You know it, Clare, you can feel it even now as we are talking. 'Just one more little thing. Whew! I'm done. Oh, I forgot...I need this, too. But this wouldn't look right without that.' It goes on and on and on. There's no stopping it. There's no end to it. It is nefarious." Of course, I had to look that word up. It means wicked or criminal. "The nefarious activities of the organized- crime syndicates"
Jesus clarified, "Translate it this way, 'The nefarious activities of organized groups of demons of lust, acquisition, preoccupation, greed, avarice (avarice is HUGE), perfectionism - never finding the perfection it seeks, yet forever promising it and luring you deeper into distractions, idol worship and sin.'" And it's interesting, because I had gotten another reading earlier in the day about the idol worshipping pagans that Paul had gone to and how they worshipped the things of their hands, gold and silver and so on. And the Lord always brings that up in talking about idolatry, along with avarice, in relation to this particular difficulty of mine. "It's not the need, My Love, it's the driving passion or more correctly, lust, that ensues on the heel of the need. Under the guise of, 'Get it all done and over with.' Yet, there never truly is an end. Like that deep sea fish with the luminous fishing rod coming from the tip of its head. 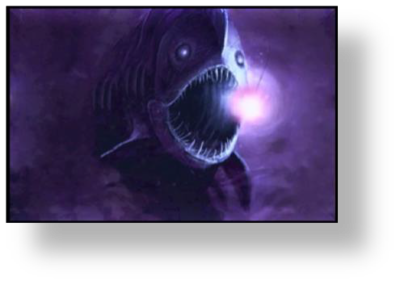 (The angler fish.) The bait is putting off a glow enticing its prey into its mouth. The mouth and jaw are distended along with the stomach so the prey can swim right in and before they know it the teeth, which are angled inwards, trap them. The trap door shuts and then you realize you have gone too far. It is an unhealthy attachment to things. It brings a superficial satisfaction. It only lasts a short while, but then, emptiness again. "The emptiness is because it doesn't fit in the God Spot. Part of the lure is the promise of a good meal, but rather than eating well, it is eaten. The enemy eats your lunch. Time is spent that can never be recovered on superficial things. People around the world go without and with very little while those who seek possessions have an over-abundance." But, Lord, these people have worked hard to have their abundance. And, I'm ashamed to say it, but I've even jumped out of bed and booted up the computer because there was a search engine word I hadn't used to find something, when I was in the process of trying to find what I needed. "I wish for you to be satisfied with very, very little. Because in finding your satisfaction with little, you demonstrate the very minimal importance of such things. Making due rather than having it all together and perfect is much, much safer. Then, one does not become prone to excesses or constant tag-alongs...such as, 'well now that I have that, I need this, and this and this as well.' and so on and so on. "The bait is not seen as bait...all that is seen is the shining light of your desires and expectations were you to acquire this thing. You do not see how the jaws have closed behind you and made you captive until you cannot extricate yourselves. This is precisely what credit cards do. They lure you into a life where you can have everything until you find yourself hopelessly trapped in debt, and those things that put you in debt have become obsolete and you need more. "Whereas the souls who seeks first My Kingdom and all these other things are added unto it, does not become entangled in satisfying their desires. They have learned to desire very little if anything at all. They are as free as the birds and see the possession of much as an occasion of sin, entanglement and grief. Matt 6 Also, seeking the Lord first. "As I had told you before, you come from a family that has a history of seeking the things below and not those things that are above. Therefore, even though you have broken that generational curse there is still a vestige of you that enjoys acquiring things. An Acquisitive spirit. Yes, Lord, I can feel that lusting for things, that lusting for completion, getting it all right, and getting it all together. Always having the better value or the better quality. I can just feel it, like a quiet hum, kind of vibrating in the background of my heart. It's terrible! "It seeks to destroy you, Clare, and rip you out of My arms. That is why it is such a struggle for you. It would seem you would get stronger and it would get weaker, but as long as it's there you are in danger. Whether you feed it today and it lays low for a few years, or you starve it." When I was in worship I saw a black panther floating in the water like a crocodile. Only its nose, ears and eyes were above water. It was watching me very carefully to see what my next move would be, and it was ready to pounce. "The only way to victory over this is to deny yourself, pick up your cross and follow Me. When it becomes necessary, I will give you a peace about meeting your necessities. But until then, it is better to ignore it altogether." "I know all the things you were thinking my love, and I know what that panther is thinking, too. You have slipped just a little and been a victim, distracted by opportunities to satisfy this need, or that need...but that little slip was only the beginning of a serious downward spiral until you reined it in. Now, I am happy with your resolution to stop here. But do be on the lookout, the enemy is seeking to destroy your soul and pull you away from My arms. Don't let him do it. This is not a casual warning, this is a serious warning. "The dream you had last night, what attacked you?" Tell them about it. I had a nightmare last night that was probably the most powerful nightmare I've had in a long time. I had walked into a room, it seemed like it was a room in my house. And I thought to myself, 'This room feels a little funny - I wonder if there is someone behind the door?' The door was wide open. So, I started to pull the door a little bit towards me, to see if someone was behind it, and this very strong man just leapt out from behind the door, totally overpowered me and started stabbing me. I started screaming immediately, and calling for help. And, it was out loud, so I woke up Ezekiel - scared the tar out of him! It was like I was totally overpowered by this strong man. "That is the character and power of the one who wants to overpower you and cause you to lose Me. I know it seems incomprehensible to you now, that you could lose the closeness we have together, but you have no idea just how close you have come. "My Brides, know that the enemy above all things wants to deprive you of Me. To that end, he will try to make you work on the day you have for Me for rest, and church. He will make your schedule so tight, there is nothing left for Me, he will see to it that you are offered lucrative positions to curtail your time with Me. He is stalking you and He knows exactly where your hollow and weak spots are. This is why I am warning you. "This is also the season you prepare for winter; storms, the cold, necessities for the house. And these demons are skilled in pushing you over the edge of what is reasonable and necessary into what is not justifiable but in your own mind seems to be important. You lose your focus, then you lose your balance, then your relationship with Me. Don't let this season of preparing for the winter lead you into deep waters over your head where the enemy is lurking and waiting for an invitation to bring you down. "No, pay particular attention to our relationship in this season loaded with change and distraction, and you will move through it securely in My arms, not looking back with regrets.